This one is a bit different from the first two, I used 4 different colours of yarn, but worked them in simple stripes rather than fancy colourwork. 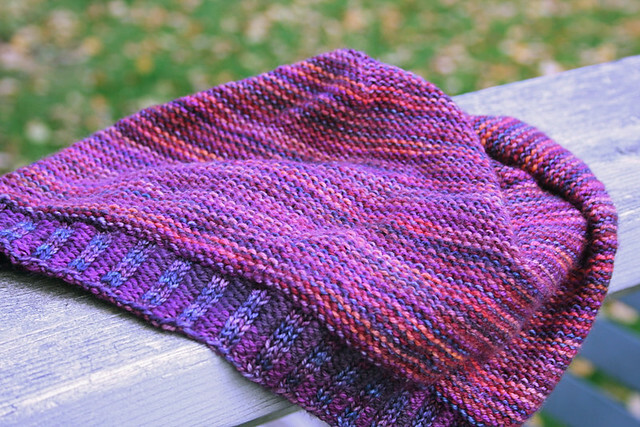 The colours I used are all TFA Blue Label yarn in Blueberry, Plum, Garnet and Sunset. I cheated a bit for the inside out look. 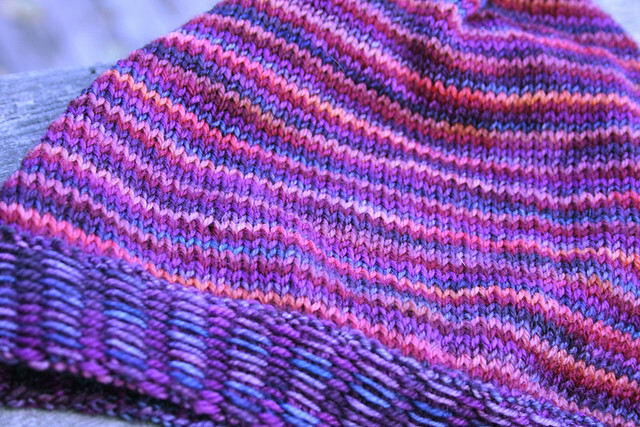 I love the look of the reverse stockinette stitch stripes, but don't love working reverse stockinette stitch... My trick was to work the two tone rib (I used Blueberry and Plum) as usual for the band, then I worked one row in knit, increasing a bit for the body of the hat, then, here is where the trick comes in, I just kind of turned my work around, so that the band was facing inside-out and worked the body of the hat in regular stockinette-stitch stripes, the only tricky part is remembering to go against instinct and carry the working yarns up the front of your work, on the stockinette side. That way, I had easy knitting for the whole hat and when I was finished I turned it inside-out and had the fun textural multi-toned hat pictured above. Pictured below is the working side of the hat, which once flipped, is the inside. Love it. I have a fourth slouchy hat on my needles now, should have it finished tonight. It's another colourwork design. Happy weekend everyone! Don't forget to check back tomorrow for the announcement of this week's giveaway! There's still one day left to enter.